Today, the official start ZeusUm. 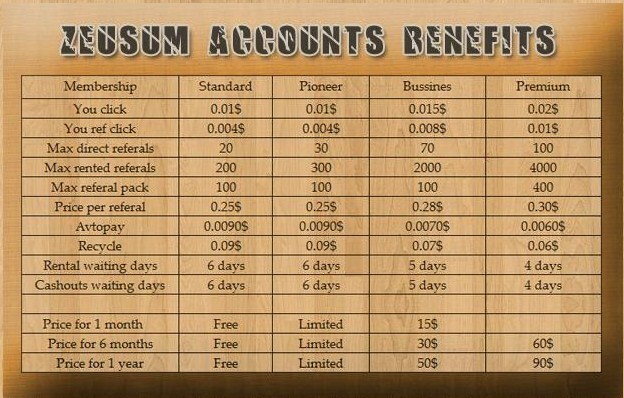 We have developed an economical price, which will keep ZeusUm stable. We accept: Alertpay and LibertyReserve. We use cloud hosting and have DDos protection. SSL is installed in a few days. Cashout: If you have at least $1.50 accumulated, you can click on "Request Payment"within Member's Area and it will submit your request. You need to accumulate at least $3.00 for your 2nd Payment Request and $6.00 for your 3rd. Currently, we make payments with AlertPay and LibertyReserve.